This afternoon Gord and I did the Indie Boat Hop Craft Beer Cruise ... we did it last year and had fun. Tickets were $40 and included an Indie Boat Hop mug (which held eight ounces), a drink ticket and a three hour sail (from 1pm to 4pm). Extra drink tickets were $4.50. We had access to one-offs, collaboration brews and a few hard to find beers /ciders from eight breweries and one cidery (Amsterdam, Bellwoods, Clifford Brewing, Great Lakes, Indie Alehouse, Nickel Brook, Sawdust City, Stone City and West Avenue Cider). Though it was crowded, once everyone got on board and got a drink, the line-ups were okay. I enjoyed some West Avenue Heritage Dry Hard Cider. I also had some Nickel Brook Raspberry Über Berliner Weisse. We hooked up my pal, Denyse. 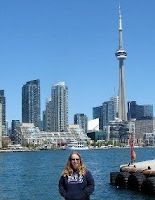 We went around the Toronto Island and back. The views were lovely. Denyse's friends, Kasie and Zeke, were also on board and it was fun to hang with them. It was a fun cruise and I look forward to doing it again next year. Wonderful weather to be out on the water having fun.